Diabetic patients participating in a national stem-cell study through Animas Foot and Ankle saw lingering and painful wounds on their feet finally heal. Dr. Nicholas Hugentobler, a podiatrist, enrolled 13 patients in a national study through the company Celgene. The trial is testing the effectiveness of injections made with stem cells from placentas that helped heal wounds, known as diabetic foot ulcers, said Hugentobler, whose clinic is affiliated with Animas Surgical Hospital. Diabetic foot ulcers are sores that can last for years because those with diabetes struggle with decreased blood flow. In some cases, the wounds can lead to infection and limb loss and death, he said. Neither the doctors nor the patients participating in the study know who received the stem-cell injections or the placebo. In addition to the injections, patients received all the care a regular patient would receive, such as a full cast, to keep them from walking on the wounds. In spite of the blind nature of the study, Hugentobler saw such significant results in some patients he has strong suspicions about who received the injections. In one case, a diabetic patient who had struggled with a 10-square-centimeter wound on his foot for five years healed after receiving the injections, he said. The trial started a year and a half ago, and it will end in six months. When it is complete, Hugentobler will find out who received the injections. Hugentobler was skeptical of participating in clinical trials before working with the stem-cell injections because he didn’t fully understand the trials and the benefit to patients. But now, he plans to participate in more. “This has been an eye-opening event for me,” he said. He is currently enrolling patients to test a medication by Genentech that boosts immunity of diabetic patients with wounds. He is also planning to participate in trials that will test pain medication and treatment for athlete’s foot. “The medical field is ever changing … and it’s beneficial to be on the cutting edge,” he said. For those with diabetes, the stem-cell treatments offer a glimpse into future strategies to deal with dangerous wounds that are easy to acquire because diabetic patients can have trouble feeling their feet, a condition called neuropathy. About 25 percent of patients with diabetes will develop a wound, he said. “You could step on a thumbtack and not know it’s there,” Hugentobler said. 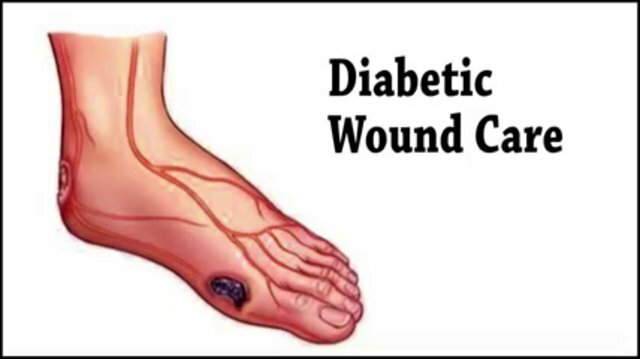 Once acquired, the wounds are slow to heal because diabetic patients have poor blood flow. One step on a wound can extend the healing process for two weeks, he said. Even diabetic patients who take excellent care of themselves can experience neuropathy, he said. Nationally, wounds can add $9 billion to $13 billion to the annual costs associated with diabetes, according to Medscape, a medical publication. In addition to improving patients’ ability to heal, the stem-cell injections restored some feeling in the patients’ feet, he said. The upcoming study will rely on a medication made with interleukin, proteins emitted by white blood cells that boost the body’s immunity to prevent infections and help preserve limbs. Nationally, few people have been enrolled in the study, and the clinic has not enrolled anyone in the study because of its stringent requirements, he said. Those who participate in a trial do not pay for their care and they are compensated for their time. The compensation is a draw for some patients, but participation also helps to further science and develop new medications. “The fact of the matter is, it’s a fairly selfless act,” he said.